The gradient doesn't look like in the original illustration, as I chose to generate the rainbow logically instead of using the Dev Tools picker or something like that, but other than that, I think I got pretty close—so let's see how I did it! So the approach we take here is using conic-gradient() backgrounds and then getting rid of the part in the middle with the help of a mask. Let's see how that works! We've also placed the .∞ element in the middle of its parent (the body in this case) both vertically and horizontally by using the flexbox approach. In order to create the conic-gradient() backgrounds for the two halves, we must first understand how the conic-gradient() function works. If we have just 2 stops, it's simple. The first is at 0%, the second (and last) at 100% and there are no other stops in between. In general, if we have n stops, the first is at 0%, the last at 100%, while the ones in between split the [0%, 100%] interval into n-1 equal intervals spanning 100%/(n-1) each. If we give the stops 0-based indices, then each one of them is positioned at i*100%/(n-1). Let's say we keep the saturation and the lightness fixed at 85% and 57%, respectively (arbitrary values that can probably be tweaked for better results) and, for example, we might go from a start hue of 240 to an end hue of 300 and use 4 stops. We create the list of stops $list which is originally empty (and which we'll return at the end after we populate it). We also compute the span of one of the equal intervals our stops split the full start to end interval into ($unit). On the left half, we start from something that looks like it's in between some kind of cyan (hue 180) and some kind of lime (hue 120), so we take the start hue to be the average of the hues of these two (180 + 120)/2 = 150. So... do we go up or down? Well, we pass through yellows which are around 60 on the hue scale, so that's going down from 150, not up. Going down means our range is negative (-180). However, we don't want these conic gradients to start from the top. For the first disc, we want it to start from the right—that's at 90° from the top in the clockwise (positive) direction. For the second disc, we want it to start from the left—that's at 90° from the top in the other (negative) direction, which is equivalent to 270° from the top in the clockwise direction (because negative angles don't appear to work from some reason). The next step is to cut holes out of our two halves. We do this with a mask or, more precisely, with a radial-gradient() one. This cuts out Edge support for now, but since it's something that's in development, it's probably going to be a cross-browser solution at some point in the not too far future. We're getting closer, but we still have a very big problem here. We don't want the right part of the loop to be completely over the left one. Instead, we want the top half of the right part to be over that of the left part and the bottom half of the left part to be over that of the right part. In order to better understand how this works, consider the two card example below. When we rotate them around their x axes, they're not in the plane of the screen anymore. A positive rotation brings the bottom forward and pushes the top back. A negative rotation brings the top forward and pushes the bottom back. Note that the demo above doesn't work in Edge. Adding perspective makes what's closer to our eyes appears bigger and what's further away appears smaller and we use way smaller angles. Without it, we have the 3D plane intersection without the 3D appearance. 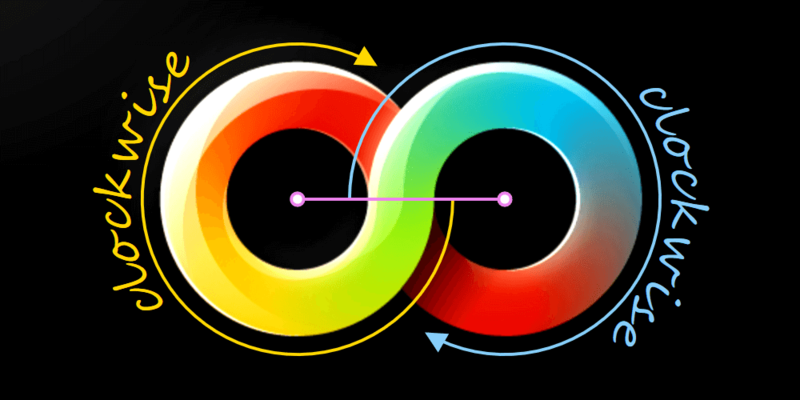 Note that both our halves need to be in the same 3D context, something that's achieved by setting transform-style: preserve-3d on the .∞ element. 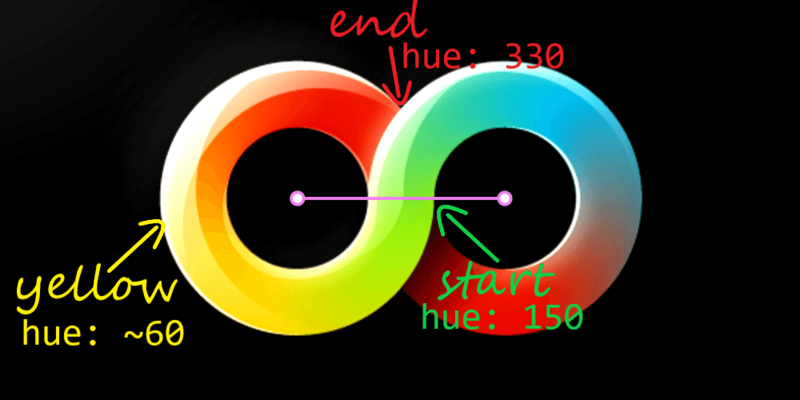 Finally, we add some prettifying touches by layering some more subtle radial gradient highlights over the two halves. This was the part that took me the most because it involved the least amount of logic and the most amount of trial and error. At this point, I just layered the original image underneath the .∞ element made the two halves semi-transparent and started adding gradients and tweaking them until they pretty much matched the highlights. And you can see when I got sick of it because that's when the position values become rougher approximations with fewer decimals. When I first shared this demo, I got asked about animating it. I initially thought this would be complicated, but then it hit me that, thanks to Houdini, it doesn't have to be! As mentioned in my previous article, we can animate in between stops, let's say from a red to a blue. In our case, the saturation and lightness components of the hsl() values used to generate the rainbow gradient stay constant, all that changes is the hue. Sadly, this means support is limited to Blink browsers with the Experimental Web Platform features flag enabled. 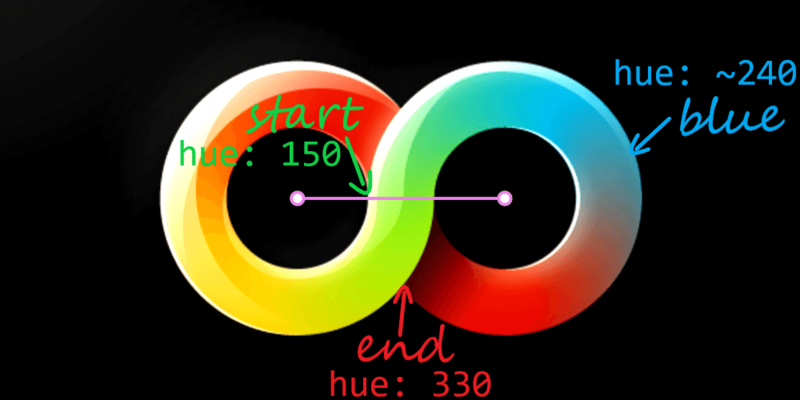 While conic-gradient() is supported natively without the flag starting with Chrome 69+, Houdini isn't, so no real gain so far in this particular case. Still, let's see how we put it all into code! Note that inherits is now required, even though it was optional in earlier versions of the spec. That's it! I hope you've enjoyed this dive into what can be done with CSS these days! Very nice! This could be made into a nice loading animation component.